I want to buy a chair. Not a fancy one with all the bells and whistles. There is such a thing after all as a sense of proportion in the purchase of furniture. Just check out what the Western Province Chief Minister’s office is ordering and you will get a sense of how it is not kosher into the bargain. But still it is a chair of some character and circumference – mine is. It may not cost Rs. 650,000 – or a mere 640-thousand quid, according to the Western Province spokesperson’s prompt correction of the media’s mistakenly overblown estimate! And I don’t want 107 of them, as the Western Provincial Council (WPC) does… just one – but no pomp and circumstance, as with a WPC model. There are, however, some accoutrements attached. As you know, Mr Chief Minister, a chair is not just a chair – it’s a place to park your brain, brashness and bumptious ego. Sorry to say, though, that the ‘domestic powers that be’ (mine) don’t quite see eye-to-eye with me. They – or she, if you insist – think a chair is a functional piece of furniture and must not be ‘a machine for living in’. (She likes Le Corbusier less than I do – oh, look it up!) So just like the kerfuffle on today’s free press a.k.a. untrammelled social media has led the WPC to “temporarily suspend” plans to import 107 chairs at 650K a pop – sorry, ‘only’ 640 – my own WPC (Wifely Provisional Chairperson) has stymied my own purchase of a brain or ego case. So not at all in high dudgeon, I flung myself out of our ‘machine for living in’ (viz. – a house, according to Le Corbusier) and hied my sorry fundament down to the beach. Where sun sea sand and sky – in addition to sundry passing trains – tend to soothe my sorrows in time of Sturm und Drang (oh, do look it up). My intention was to mull over the conundrum of how much a chair must cost and other such mundane matters. Sadly there were no trains to be had for love or money. At the time of writing, it was the third day of the strike. And then there was no solution to the trade union action impasse in sight. Many commuters were severely inconvenienced, among them over an estimated 350,000 workers who ride the rails into and out of the country’s commercial capital on a daily basis. 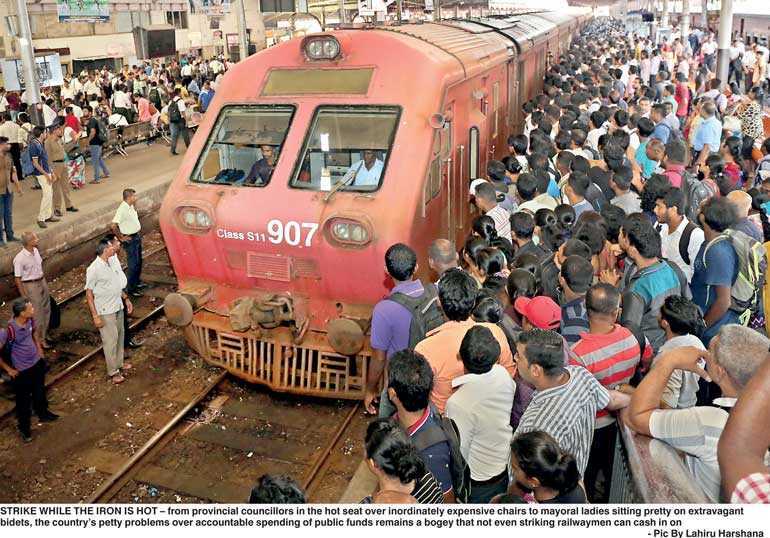 If there is one lot of people clinging on for dear life to what is precious with whom I sympathise more than a chair-less WPC chief minister, or a man by the sea whose WPC-less chair has been vetoed, it’s these commuters who risk life and limb everyday just to get to their bread and pol sambol. For a ‘trinitarian’ train buff like me (spotter, traveller, modeller), the present crisis in the Sri Lanka railway comes with mixed feelings. On the one hand, the potential of this national asset – if managed adroitly – makes it worth keeping in state hands in some shape or form (an Authority, a GOBU, etc.). There is also the vexed issue of subsidised rail fares, among the lowest in the world, with the state having to prop up a service that has not made a profit since 1943 – in fact, for a sense of what government pumps in, in May 2017 an estimated Rs. 3 b in revenue was overshadowed by a subsidy of seven billion LKR. On the other, chronic strikes brought on by a chimerical mix of genuine grievances and political motives alike compel government, as a savvy manager, to seek to divest it. So much more can be done to streamline plebeian passenger transport services as much as boost super-luxury tourism potential with the right mix of state track ownership, private investment in services and rolling stock, and international aid to fast-track a colonial relict into the 21st century. In-between is a gamut of subpar options on the table to reject. As well as a spectrum of stakeholders to consider: some of whom may be in play on the never-never – e.g. thugs employed by heaven-knows-who to curb strikers appear to be ‘pros’ who have seen action on other trade union fronts; brandishing iron poles and cracking skulls to disperse nuisance dissenters who put a spoke in this or that government’s wheels. Then there is the national interest to square against the derailed socio-political ethic. While privatising the railway seems the most attractive option to neoliberal conservatives subscribing to ‘trickledown economics’ popular Stateside, there are equally cogent arguments from Nordic countries among others. And the latter militate in favour of strike action being leveraged to push Sri Lanka in the direction of a more ‘socially-democratic’ Democratic Social Republic in more than name. While watching empty trains parked forlornly at termini or in the yard – with some driverless engineers’ seats littered with shattered window-glass from stones thrown by more aggressive strikers, or perhaps politically motivated thugs – my mind idled over another hot seat and its incumbents. Because while locomotive chairs remained empty pending the deployment of trained army personnel, the executive hot seat continues to be occupied by a succession of presidents who strike while the iron is hot. Thanks to a vision inherited from a democratically frustrated leadership of the past and bogged down in present concerns, the mercurial presidency will no doubt imperil our experiment with republicanism until the next round of constitutional reforms springs us free of its shackles. In the interim, given the state of the nation and its strikers, the only light at the end of the tunnel may be the Down Express of privatisation of the railway – heading for a collision with our social-democracy at high speed. If only I had a cosy comfy cushioned chair to sit in rather than on this jagged edge of a seaside rock where no trains run, I’d be able to see a solution more clearly now that the train strike is ‘temporarily’ gone.